When Cleveland bid in 2006 for the Republican National Convention they proposed housing the media on the first several floors of the then vacant Higbee Building, now the Horseshoe Casino. When they bid again last year for the 2016 convention, they had the brand new Cleveland Convention Center and all of its high-tech amenities at their disposal to fill the bill. But lead attorney Jon Pinney of Kohrman Jackson & Krantz remembered what a member of the RNC told him after they fell short eight years earlier. He said if they were to ever bid again they should consider the Gateway East garage for the media. Local developer Geis Companies put together renderings of how they could convert the garage into an office building. Enclose it, put in carpeting, walls and air conditioning. A vision that also includes an auditorium, information center and rooftop lounge for the media. 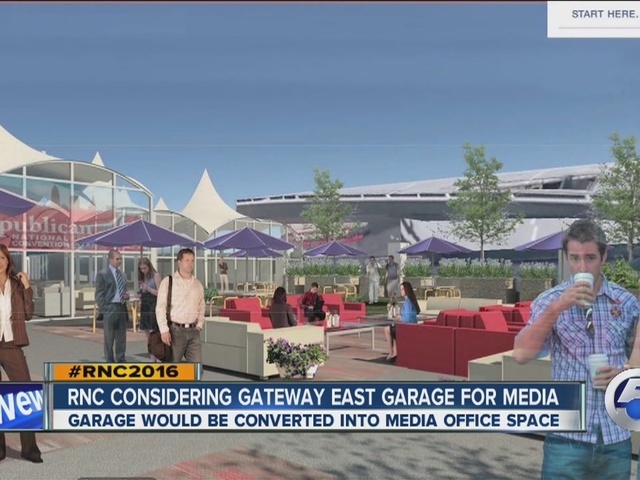 Because the garage is attached directly to the arena it would eliminate the need to bus members of the media across town from the Convention Center, a setup similar to what the RNC had in Tampa in 2012. It would also cut back on the number of times the media would have to go in and out of the security zone that will be set up around Gateway. Ultimately Pinney said the decision on whether to use the convention center or Gateway East rests with the RNC on which will work best for them.